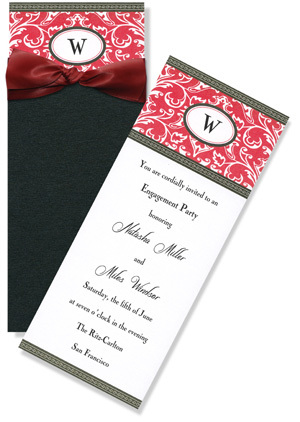 Elegant red and black damask design features contrast borders and a center oval for placing an initial, monogram or names. 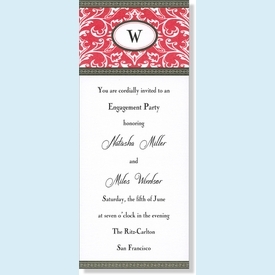 Printed on shimmery 100# cardstock and oversized for an impressive presentation. Shimmery pearl envelopes included. UPGRADE to add black pockets and black satin ribbon ties for a more elegant impression. NOTE: Only 3 sets left! SIZE DIMENSIONS: 4.5" x 11"